One of the most cheerful and kind people you could ever meet, Dr. Takamine is one of the leading academics in the field of shochu research. An increasing amount of data shows that as far as alcohol is concerned, it’s difficult to find a drink that has as many benefits as shochu. Dr. Takamine is a professor at Kagoshima National University. I recently had the opportunity to listen to a talk given by Dr. Kazunori Takamine, an engineering professor at the Shochu Fermentation Research and Education Center at Kagoshima National University. 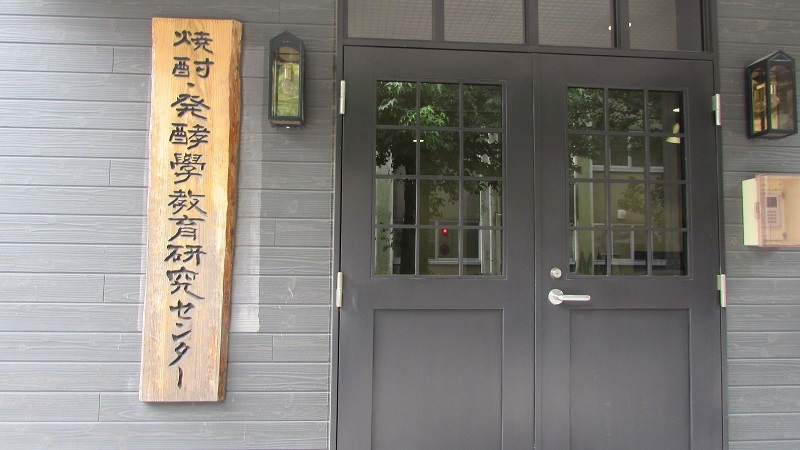 The center was founded in 2006, originating from the creation of an endowed professorship for the study of shochu, and it was constructed as an affiliated institution with Kagoshima National University’s Department of Agriculture. The center currently employs full time faculty conducting research into various aspects of shochu, with particular energy focused on the fields of production and the study of the microorganisms that cause fermentation. The center is also home to a considerable number of international students. 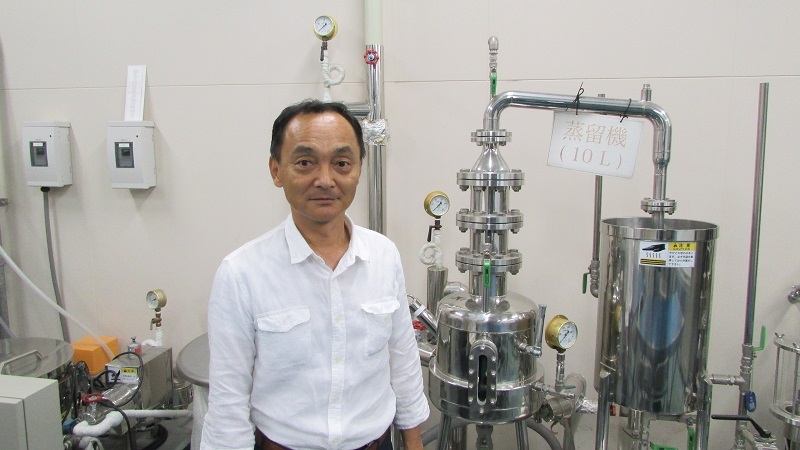 Dr. Takamine is one of the leading faculty members at the center, and his research has targeted several areas related to the further development and refinement of honkaku (authentic or traditional) shochu products. The wellequipped laboratory a few steps from his office at Kagoshima National University houses technology for identifying and analyzing the effects of the many esters and aromatics present in shochu. These machines have been used to evaluate the manufacturing process of kokuto (Japanese brown sugar) shochu from the Amami Islands south of mainland Kagoshima Prefecture. He has also supervised studies of fermented food production and the various organic compounds created during fermentation. But more recently he has begun conducting joint research into the effects of shochu on human health with Professors Akio Inui and Akihiro Asakawa of Kagoshima National University’s Department of Medicine. Kagoshima National University is the only university in the world that has a shochu distillery on campus. Dr. Takamine’s office is located on the second floor above the distillery. Since shochu is our focus here, let’s imagine that you get a typical “city” pour of around 50 ml. This is far less shochu than is typically served in izakaya in Kagoshima Prefecture and the rest of Kyushu Island, but it’s not an uncommon volume for metropolitan areas such as Tokyo and Yokohama. Consumed straight, a 50 ml pour of 25% alcohol shochu will logically contain 12.5 grams of alcohol. 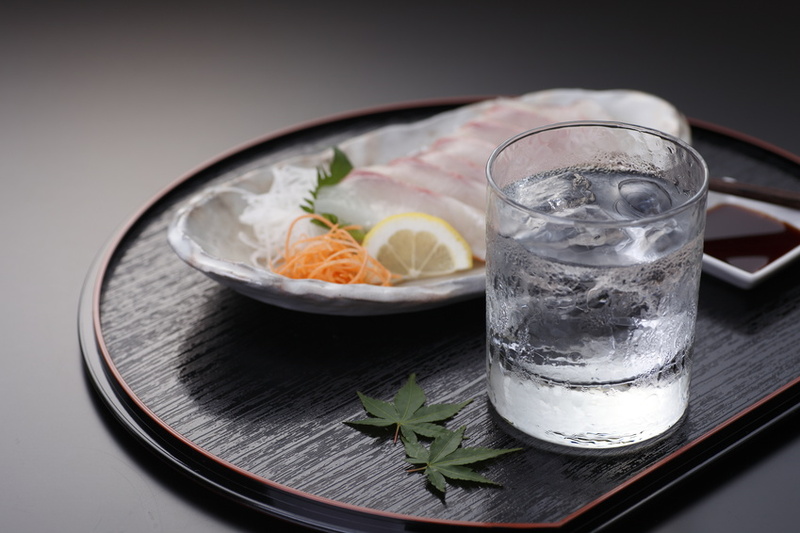 However, it is far more common in Japan to mix shochu with cool or hot water. Sweet potato shochu from Kagoshima is often mixed roku-yon (6:4 shochu to water) which drops the ABV to 15%, but other ratios are certainly possible and you should find one that suits your particular tastes. There is also some research indicating that honkaku shochu has the effect of dissolving blood clots. Data from a study published in 1988 by Dr. Hiroyuki Sumi outlined the thrombolytic activity present in the bloodstream after drinking shochu. Currently a professor at Kurashiki University of Science and the Arts, Dr. Sumi found that shochu stimulates thrombolytic activity on a level comparable with red wine. Not only does this improve blood flow, it also means that Japanese honkaku shochu is somewhat hangover resistant since it is a pure spirit and additives or sweeteners cannot be added before bottling. 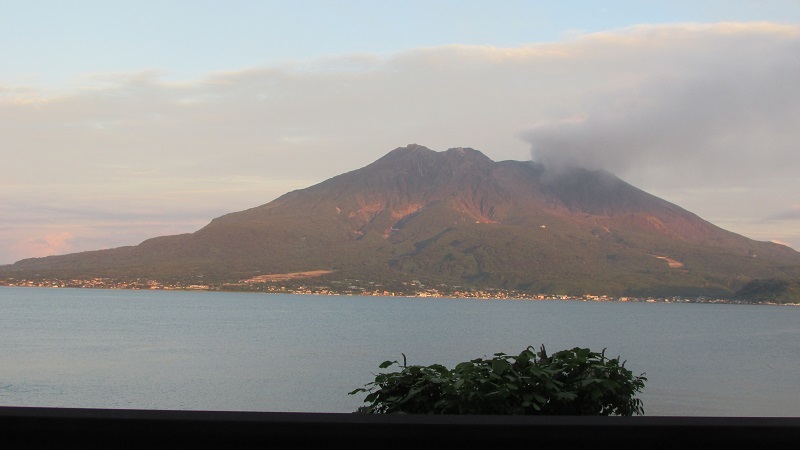 Sakurajima, one of the world’s most active volcanoes, is located just across the bay from downtown Kagoshima City. Shochu is also commonly recommended by physicians in Japan for people suffering from gout. “If you like to drink,” they say, “then drink shochu because it won’t cause flare-ups like other alcoholic beverages.” Also, as shochu is a distilled drink, it doesn’t contain gluten. This is certainly welcome news for those with Celiac Disease. For those looking to keep their weight in check, the lack of carbohydrates and residual sugars have also been reason enough for many consumers to trade out high calorie brewed drinks and sugar bomb cocktails in favor of the minimal caloric payloads found in shochu. It’s difficult to find another drink with a similar number of flavor profiles that can be enjoyed so many different ways. Dareyame refers to a nighttime drink paired with a meal or small dishes of food. In Kagoshima Prefecture, where shochu is usually enjoyed alongside milder foods, people have begun to pay greater attention to rising blood sugar levels. Last year, a joint team of researchers in Kagoshima National University’s Agricultural Department and School of Medicine announced that shochu has the effect of suppressing the rise of postprandial blood glucose levels. Crucially, shochu does not contain any residual sugars, and the team’s research found that shochu is more effective than water at regulating blood sugar levels. The study involved three men and three women who each drank either a glass of sweet potato shochu, sake, beer, or water with an evening meal every night for one week. They also recorded their blood sugar levels both before the meal and one, two, and 12 hours afterwards. According to the results, beer raised blood sugar levels the most. Sake and water were next in line, but shochu was associated with a minimal blood sugar rise. It is hoped that additional research will shed light on how shochu’s regulation of blood sugar concentrations might be applied to health issues stemming from diabetes and obesity. In the meantime, additional testing is being planned to try to corroborate the team’s findings with a larger cross-section of society. It goes without saying that dareyame is a time-honored and tested tradition in Kagoshima and much of Japan. There are few things more relaxing than ending a work day with some delicious food and drink. It’s like hitting the reset button, and the science is starting to show that the residents of Kyushu have long been onto something. I’m sure that Dr. Takamine would agree with me when I say that you should gather with some friends or family and enjoy a couple glasses of shochu tonight. Shochu pairs well with all kinds of food, including sashimi. **Reprinted with permission by The Kyushu Advantage. The original version of this article appeared in the 2018 edition of Zipangu Japan. Read the original version here.